Each year, hundreds of volunteers generously give of their time and talent to further Cure JM’s mission to find a cure and better treatments for Juvenile Myositis and improve the lives of families affected by JM. Dozens of medical researchers also work tirelessly in pursuit of better treatments and a cure for JM. The work of Cure JM could not continue without the commitment and determination of these passionate people. Each volunteer, each Cure JM family, and every researcher makes an important contribution toward our shared goal of finding a cure for Juvenile Myositis. In 2010, Cure JM began a tradition of recognizing people who had made a significant contribution towards advancing Cure JM’s mission. Please join us in celebrating these award recipients and their contributions toward advancing Cure JM’s mission. This award was established in 2016 to celebrate a scientific researcher who has dedicated 15 or more years to JM research, and made significant advances in the field of juvenile myositis research. Advancing the field of juvenile myositis takes a brilliant scientific mind, a passion for juvenile myositis research, and a devotion to training young researchers. 2018 recipient: Ann M. Reed, M.D. 2017 recipient: Lisa Rider, M.D. 2016 recipient: Lauren Pachman, M.D. In 2013, Cure JM established a special award in memory of Mason Smedley, named The Mason’s Miracle Award. Mason was, and continues to be, an inspiration to everyone. He showed great courage and strength in his battle with JM. Despite his challenges, he had an amazing sense of humor, and his charm instantly won over everyone he met. Mason was, and will always be, a true hero and has made a difference in countless lives. This award is now given annually to someone who carries on the spirit of Mason, and demonstrates the unfaltering courage, optimism and perseverance that Mason showed us all. This award is to honor a physician who has shown exceptional commitment to JM patients and families. 2018 recipient: Colleen Correll, M.D. 2017 recipient: Ruy Carrasco. M.D. Established in 2012, the Cure JM Champion Award is given to a person or family who has made a significant difference for Cure JM and the children battling Juvenile Myositis. Champion Award winners have been instrumental in helping us advance research, improving the lives of those who battle this disease today and paving the road for a cure in the future. The Grandparent Ambassador award was established in 2018 to recognize grandparents of JM patients who demonstrate extraordinary commitment to advocating for JM patients and their families. These teens have been an anchor of support in the Cure JM teen and young adult community, providing support and comradery to teens with Juvenile Myositis. They have been instrumental in creating the Teen Portal on the Cure JM website, providing online support to other teens, and supporting teens and young adults in person at the Cure JM Conference. The Cure JM Hero awards were established in 2010 to recognize families and individuals who have made a significant contribution to Cure JM and have helped advance Cure JM’s mission to find a cure and better treatments for Juvenile Myositis and improve the lives of families affected by JM. A Special Thank you to Marge Coffey for her outstanding support of the Drug Development Program at National Center for Advancing Translational Sciences (NCATS). The Excellence in Advocacy award goes to a Cure JM volunteer who has stepped forward and shown extraordinary leadership through advocating for, connecting, supporting, and educating Cure JM families. 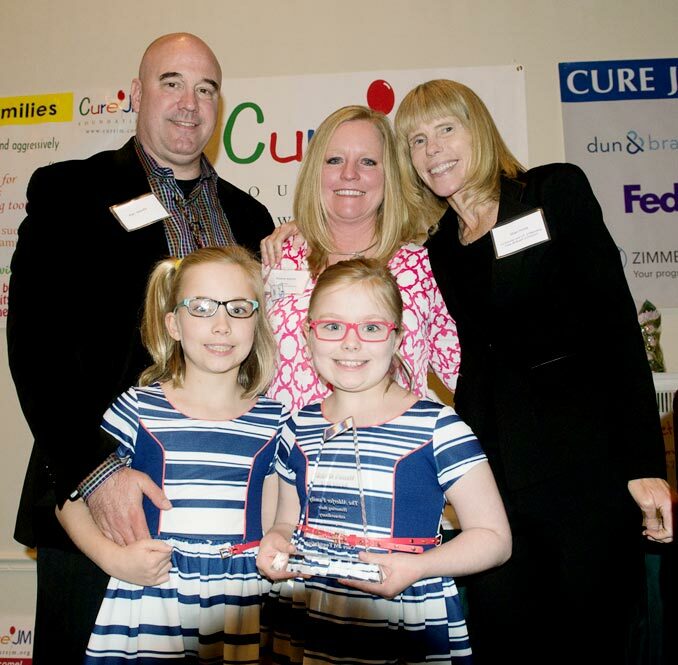 The Cure JM Legacy Leadership award was established in 2014 to recognize a person or family who has made an exceptional, long-lasting impact for Cure JM and the advancement of JM research. The impact of this individual or family is viewed as transformational and will live beyond their tenure – thus leaving a legacy for many years to come.